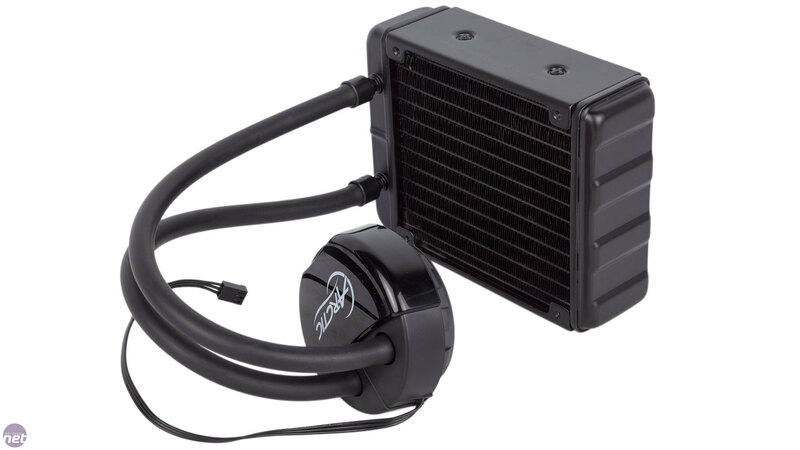 Arctic announced its entrance into the CPU all-in-one liquid-cooler market in November last year. 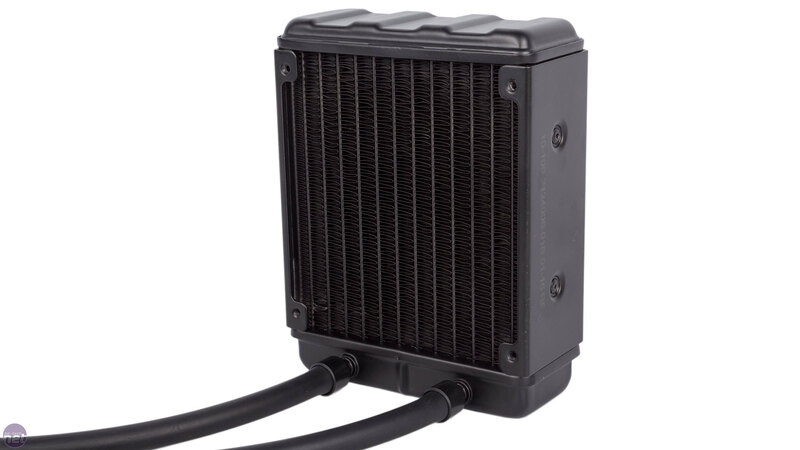 It's pretty late to the party, then, but nevertheless it's looking to make a name for itself and compete against the big boys with two products, the Liquid Freezer 120 which we're looking at today and the larger Liquid Freezer 240, based unsurprisingly on 120mm and 240mm radiators respectively. Pricing is somewhat all over the place for this product. 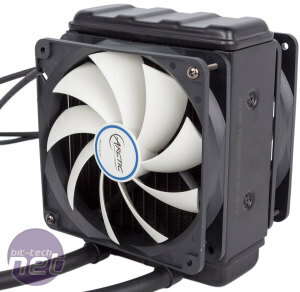 The cooler is listed on Arctic's own website as £60.99, yet some retailers offer it for as much as £70 while elsewhere it's sub-£50: it's in stock at AWD-IT for £47.99, which is a seriously competitive price point. Starting with the pump unit, we find a copper base that is highly polished as the result of CNC machining. Unlike certain Corsair models, it comes without mounting arms attached or thermal paste applied, adding a few extra stages to the build process. 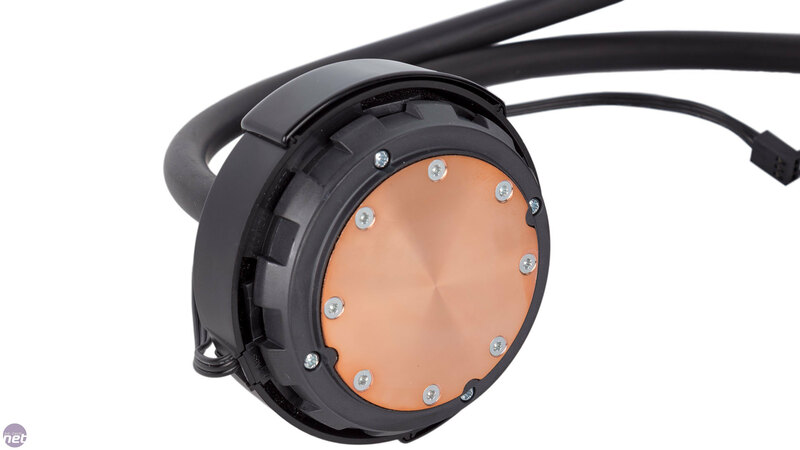 A 3-pin black cable emerges from the unit to power the fixed speed pump, which is said to be very efficient and consume merely 2W. Aesthetically, we can't say we're keen on the glossy black plastic covering here, especially as it will be covered in fingerprints by the time you're done with it. Still, it's easy to clean once it's in place and is unimposing after that. The tubing is 326mm long, which is plenty to play with. 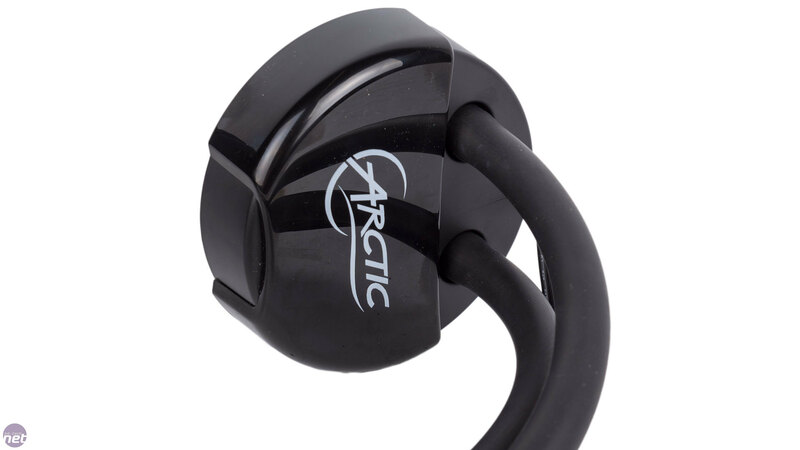 It's the rubber style rather than the FEP plastic style, and we think this is the better looking choice. 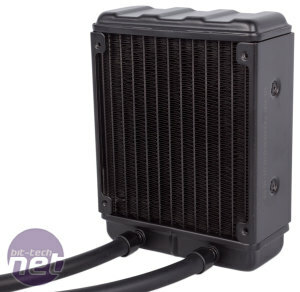 The aluminium radiator is thick at 49mm and this coupled with the dense fin arrangement should provide plenty of surface area for heat dissipation. Overall the build quality of this cooler is pretty solid. 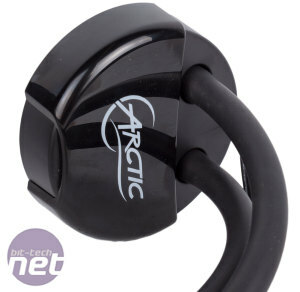 A pair of Arctic's F12 PWM PST fans are supplied for a push-pull configuration. 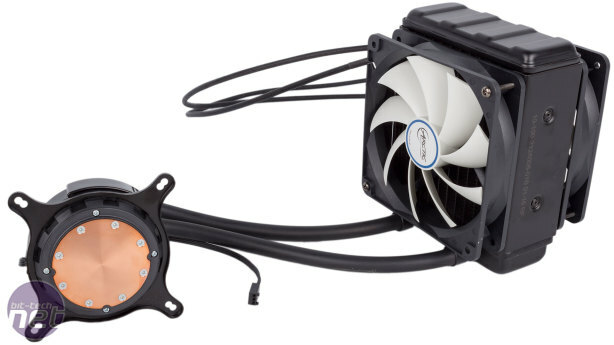 It's worth noting that this will extend the total depth of the radiator setup to 100mm or so, although you can of course only use one fan should you wish. 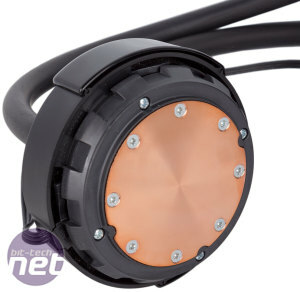 PST stands for PWM Sharing Technology, and essentially means that the fans each have a splitter at the end of their braided cables so that they and the pump can all be daisy-chained and powered from a single PWM header – handy if your motherboard is short on them. 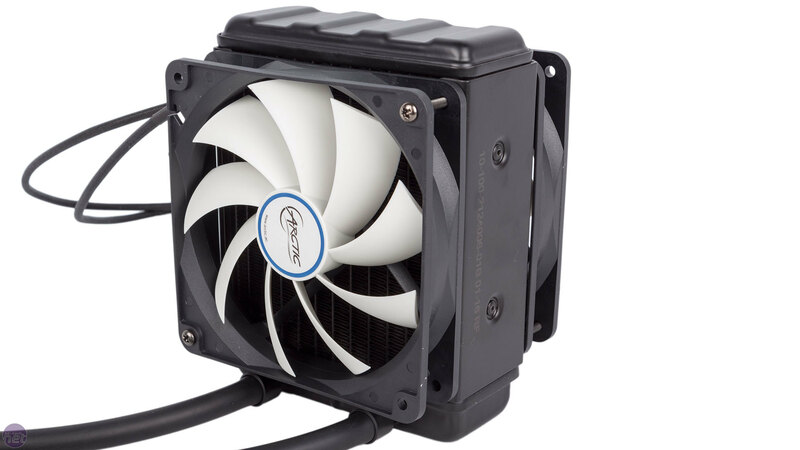 The fans are designed with computational fluid dynamics to generate high airflow, despite only having a maximum speed of 1,350 RPM – the angle on the nine blades is certainly sharp. 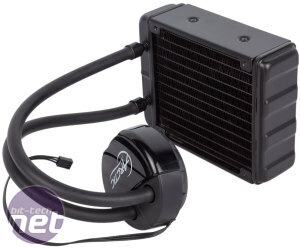 The fans also use a fluid dynamic bearing. Installation is all fairly straightforward. You first twist and lock the Intel or AMD mounting bracket into place. 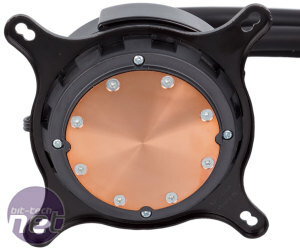 A backplate is supplied for LGA115x users and this is secured from the front side by double-sided screws. 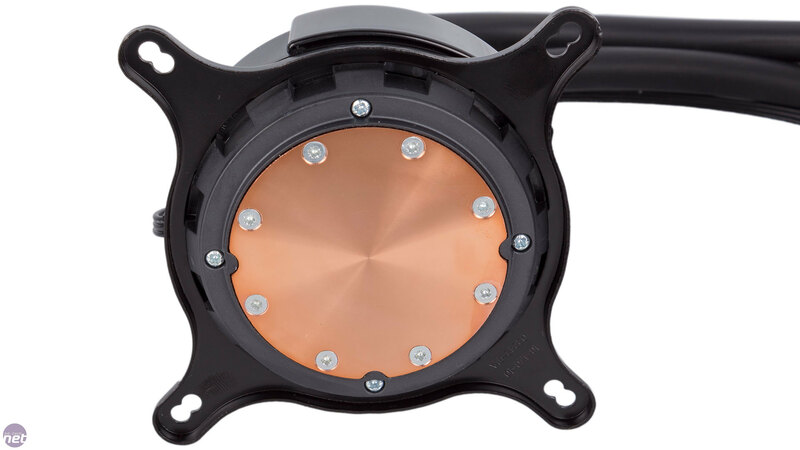 Meanwhile, LGA2011(-v3) users will use screws that go directly into the socket and AMD users will use ones that screw into the standard AMD retention bracket. After this, you apply some of the MX-4 thermal compound – a sachet with enough for two mounts is supplied, but we managed three easily – before securing the pump unit to the mounting screws with some thumb-nuts. The last step is securing the fans and radiator with the usual selection of screws and washers. A couple of issues arose during installation worth noting. Firstly, on the AMD socket it proved difficult to push the mounting bracket arms down far enough to allow the nuts to catch the threading of the screws. Thankfully this wasn't the case on either Intel socket, and while we're on that topic we're pleased to see a lack of support for LGA775 and LGA1366 sockets as it makes the backplate easier to work with than universal ones. On every socket, it's important to get the pump's position right to avoid conflict with the radiator, at least when installing in the usual rear exhaust position. The long tubes mean there may be quite a bit of bending in them but they never kinked, and the two supplied zip ties are handy since the fan cables are also on the long side.